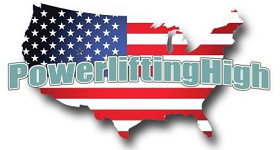 USA Powerlifting-NY would like to spotlight some of the stand-outs in the state. We will feature a new lifter each month, and ask them some random questions to get some insight into what makes them tick….. This month’s featured lifter is MEGAN HIMES. I am a full-time student earning a degree in Art Education at Buffalo State College. I consider myself a very passionate individual that is focused on human development through education, art, physical activity, and nutrition. Megan Himes: I first got interested in powerlifting when I discovered Meg Gallagher (aka “megsquats”) on YouTube. She made powerlifting seem very accessible to women, with plenty of content on proper technique and training habits. I had tried multiple sports and hadn’t absolutely loved any of them, so I decided to give powerlifting a go, starting in my high school gym. I trained at the same time as the football team and I was the only girl in the gym (talk about gym-timidation). MH: My first meet was “Mustache Mayhem” at Impact Fitness Systems in February of 2018. MH: Every meet, training block, and session I feel there is always something to take away. I have learned so much since my very first meet, but I think one of the most important takeaways has been to rest when I need too. It is easy to get caught up in the hype, the Instagram training logs, the comparison to other lifters. I have found it very crucial to my personal success to be focused on my training and my progress, and what I need to do – rather than push myself to a state of overtraining or injury just trying to be the best. Powerlifting is a great community, but sometimes in training, you have to be a little selfish. MH: My goal in powerlifting is always to be better than the time before. This does not always have to be a PR or medal, just some form of improvement whether mentally or physically. Every experience has something of value, and it is my responsibility to make something from that. MH: My favorite movement is the squat – I love the mechanics of the movement and it feels the most natural of the three. MH: My least favorite movement is benching. It takes the longest to set up and just isn’t as fun as deadlifts and squats. MH: My training methods change depending on the time of the year and my current goals. MH: I lift as part of the team at Kenmore Barbell & Fitness. The community at this gym is unlike anything I have ever experienced. The kindness and support of all of the members and trainers at KBAF pushed me to start competing in powerlifting. I would not be in this sport today if it weren’t for the community. MH: If you are new to a barbell – focus on technique. The weights will follow. If you are consistent, dedicated, and determined, you are capable of things you would never even believe. Use as many resources as you can get your hands on and work hard. MH: Most people don’t know that I am a classically trained artist. I have experience in painting, ceramics, fiber and textile arts, murals, printmaking, and more. MH: One of my biggest inspirations in the powerlifting world is Isabella von Weissenberg. Not only is she incredibly strong with multiple international titles, but she is also one of the kindest souls I’ve ever met. Sometimes when you meet great athletes that have acquired fame they are not what you expected – but Isabella is much more than that. I admire her tenacity in training and competition, and her grace and kindness on and off the platform. She is a great role model for this sport.